JACK is system for handling real-time, low latency audio and MIDI. We “ordinary” users of Slackware don’t usually have a need for Jack. It makes your computer’s sound subsystem more complex, meaning that more things can go wrong (where you end up with distorted or even no sound) and that fixing things requires more knowledge. However there are cases even for non-musicians to want to install Jack Audio. I am one of them. As I explained in my previous post, I want to record videos of programs running on my desktop, along with the comments I may record through a microphone. When I selected SimpleScreenRecorder as my tool for doing this, I found out that it needs Jack in order to record the audio (but come to think of it… after reading bradpit’s comment in the previous post I realize that there may be a way around Jack – something I will check out soon and report if I find anything worth mentioning). 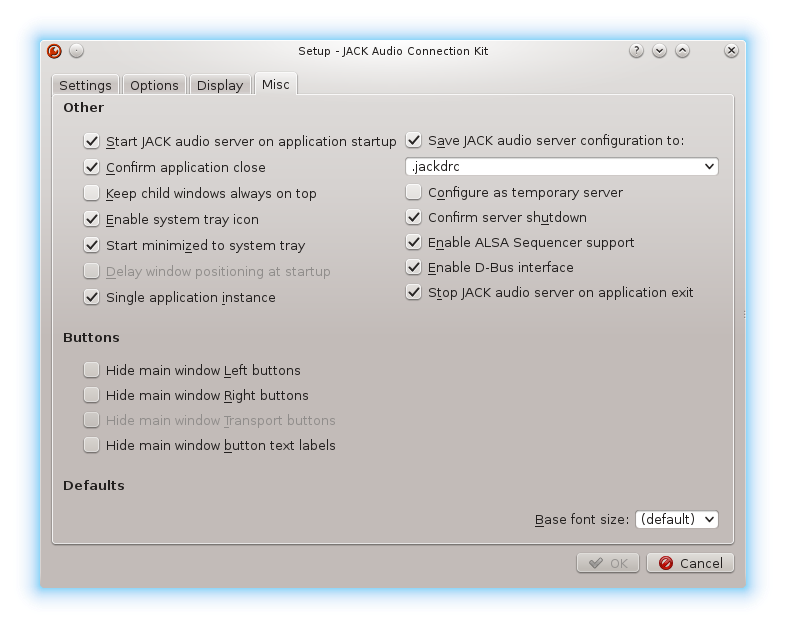 This article is meant to show you how to install and configure Jack Audio, and how to configure ALSA so that applications will still have sound even if they are unaware of Jack (Jack grabs the computer’s sound hardware and won’t allow ALSA applications to use it). The article will center around you, being the one behind the physical computer. No system file needs to be changed, all configuration is done in your own home directory, for your use only. If someone else logs in, he or she will not be bothered by Jack and everything will work as before. In order to install Jack Audio, you need the following packages: jack and qjackctl. 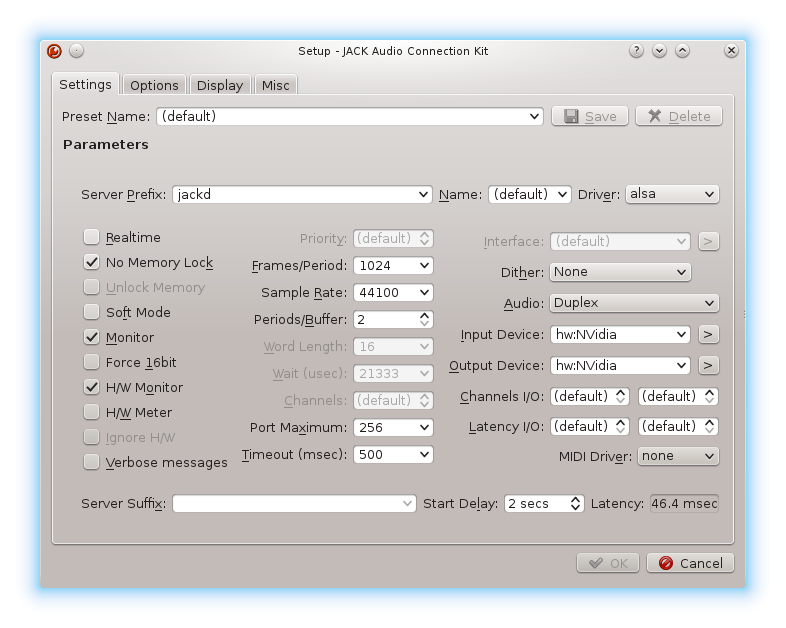 The qjackctl package contains the “de facto” configuration utility for Jack Audio, also called qjackctl. It is a Qt-based graphical program which allows you to configure “several JACK daemon parameters, which are properly saved between sessions, and a way control of the status of the audio server daemon” according to the program description. It also allows you to configure and autoload the patchbay and offers full connection control. The goal is to have a configuration where ALSA applications can access a “audio hardware” device even when the real device is locked by Jack Audio. That way, ALSA applications will not complain about unavailable audio hardware. I will show you how to provide ALSA with such a virtual hardware, and ensure that all sound which goes into that virtual hardware will be picked up by Jack and played through your speakers (hence the phrase “bridged”). This “virtual hardware” is provided by the ALSA loop driver. When loaded into the kernel, this driver provides a pair of cross-connected devices, forming a full-duplex loopback soundcard. You should add the above command-line to the file “/etc/rc.d/rc.modules” or to “/etc/rc.d/rc.local” so that the module will be loaded automatically on every boot. Create your ~/.asoundrc file as follows – if this file exists in your home directory, please back it up first! When you save that file, its content will re-define your ALSA configuration with immediate effect. KDE may complain about hardware that was added or went missing, you can ignore that for now. What these definitions do for ALSA, is to create a new full-duplex PCM device called “pcm.aduplex” with a description (which you will see mentioned in your programs’ ALSA device selectors) of “ALSA->JACK Loop Bridge”. What these definitions also do, is to create additional PCM devices for capture (pcm.cloop) and playback (pcm.ploop) which we will connect Jack to. That way, your ALSA applications are going to pipe their audio into one end of the loopback device and Jack will see this as incoming audio and play it on your speakers. If you see errors instead of the above text, then there is something wrong with the ~/.asoundrc file you just created. 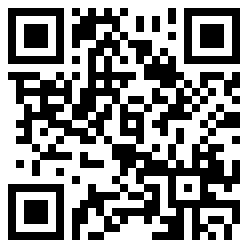 You should use qjackctl to configure the jack daemon. Jack installs a D-Bus service which qjackctl will connect to. Qjackctl can launch the daemon by itself or attach to an already running jack daemon (the qjackctl tray icon will be green if it had to start jackd and orange if it connected to an already running jackd). I found out that I needed to have a sampling frequency of 44100 (the Jack default) instead of what musicians usually use (48000) in order to prevent distorted sounds coming from ALSA applications (youtube flash videos!). Whatever frequency you choose, you will need to use the same sampling frequency in ~/.asoundrc (see above) and for jackd. The various jackd parameters all correspond to selections in the qjackctl dialog window. In the above screenshot you will also notice how the patchbay definitions are made persistent – I will show why this is important when I get to the section on SimpleScreenRecorder. You will want to start the jack daemon before any of your ALSA applications start! The ALSA driver grabs the audio hardware as soon as an application tries to make a sound using ALSA. Desktop Environments like KDE and XFCE have a feature called “session restore” which means that programs which were running when you logged out, will be started again – automatically – when you login again. A program like Skype, or even the startup sounds of your KDE desktop, will prevent Jack from launching properly. … which will solve all timing issues: the loop2jack script will start the Jack daemon if it was not yet running, and it will bridge the ALSA and Jack in- and output channels using our virtual loopback device. This way, qjackctl does not even have to start anything (but we will not change the qjackctl configuration, in case you need to stop and restart Jack during a desktop login session). You have to keep in mind that running Jack is now required after making these modifications to your ALSA setup! When Jack is stopped (or not started) your ALSA sound system is no longer bridged to the physical sound card and you’ll hear nothing. Also note that you may have a system-wide ALSA configuration file “/etc/asound.conf” which may interfere with your setup. Your own ~/.asoundrc definitions are added on top of the definitions in /etc/asound.conf and do not replace them. Reverting to the original Jack-less configuration is easy. Remove the invocation of “/usr/local/bin/loop2jack” from your ~/.xprofile and/or ~/.profile scripts. The steps (1) and (2) are sufficient to restore the default ALSA behaviour and steps (3) and (4) ensure that Jack will not interfere at next login. It’s a fairly simple layout with just a single Jack input client (being SSR) and a single output client (the entry “alsa-jack.jackP5161.0” which is the VLC program playing music). The connections you see here between Jack’s “monitor” outputs (which were activated by checking the “Monitor” box in qjackctl’s setup dialog) and SSR’s inputs are automatically created when SSR connects to the Jack server. This happens because I defined these connections in qjackctl’s “patchbay” and let them be automatically activated. It seemed to be necessary this way because I could not get the monitor’s output to start inputting into SSR except by creating manual connections everytime. This is how I was finally able to record videos of (programs running on) my Slackware Linux desktop. Feedback highly appreciated! There is another way to route the audio to and from ALSA-using applications when Jack is the sound server. 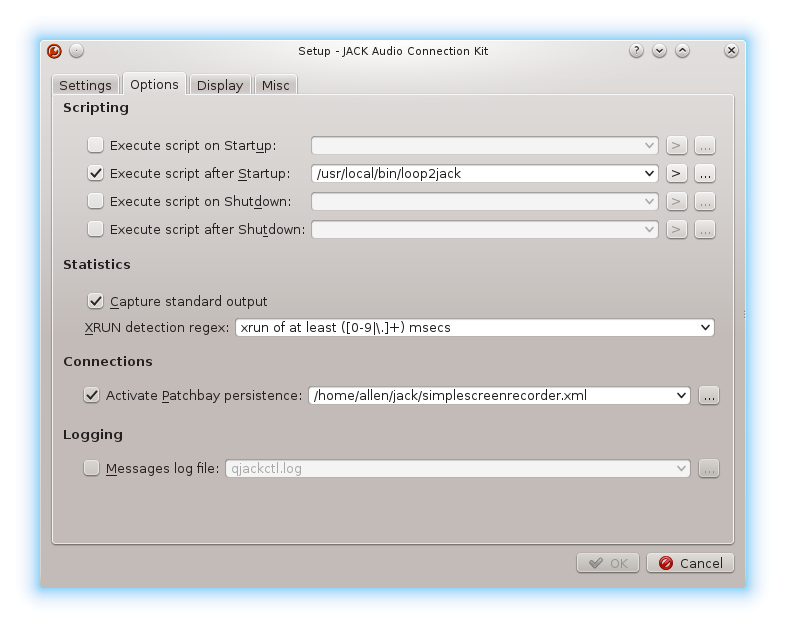 In http://jackaudio.org/routing_alsa you can see how to use the “ALSA Jack PCM plugin” which creates a new PCM type called “jack”. This is a lot simpler to setup than the above article but it is not as robust and flexible. I used this solution for a little while and was happy with it – until I found out that it will not enable me to record audio with the SimpleScreenRecorder. So I had to abandon it. You will need my alsa-plugins package for this. This package has two dependencies: jack (naturally) and ffmpeg. Note that if you want to use alsa-plugins and you are running 32-bit software which plays or records audio (think of Skype, Steam games) and you are on a 64-bit Slackware system, then you will additionally need multilib (of course) as well as “compat32” versions of the 32-bit ffmpeg and jack packages. Posted: 2 January, 2014 in Slackware, Software. I add some things like mixer to my custom asoundrc . Works like charm recording from sound card output redirected to loop device . Apart from 13.37 in recent slackware ALSA luckily not blocking sound from multiple sources the same time. This works really well, and for youtube, etc I am having fewer audio problems with 64bit apps. I am not hearing any sound in 32bit apps run through wine though. If I installed a compat32 version of jack, would I need an additional loopback for that? The only dependency for sound in Wine would be a “compat32” package of OpenAL. I can’t think of any other package you’d need. Perhaps you can start you WIne application in a terminal to see if there are any errors with regard to missing libraries. Installed compat32 version of OpenAL, although the app had worked before without it. Also re-ran winecfg and set audio devices to the loopback. Sound is now working. Thanks again for a great post. Running loop2back fails cause jack_control seems to be missing. What package is it included? The /usr/bin/jack_control program is part of my jack package. For some reason I could only see packages for slackware-13.0. Now I can see jack2 packages. Thanks mate. Recording TF2 while playing worked already like a charm. Now I can work on the sound. Yeah I have been making more of these silly mistakes recently… forgetting to upload parts of my repository. I guess I am becoming overworked, I’ll have to look out. What was also missing is qjackctl, and I am fixing that now. Could not connect to JACK server as client. – Overall operation failed. – Unable to connect to server. Please check the messages window for more info. Also, why can’t we just use Jack and not ALSA? And what about Phonon? Does what backend I choose Phonon to use have matter here? 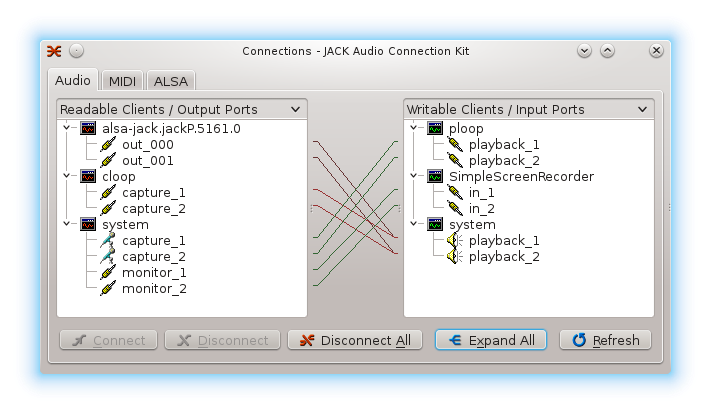 Okay, I got rid of the “Could not connect to JACK server as client” error by explicitly supplying my input and output devices in Qjackctl’s settings, but now only only my right channel outputs audio, and it’s very distorted. HTML5 YouTube videos don’t playback very fluently in Firefox through Jack… I wonder why. Okay, now for some reason both output channels work, yet YouTube videos go silent after about 20 seconds, and they’re somewhat crackly. Your quick-fire posts triggered the blog’s spam protection and I had to move yours out of the spam bin. This blog is not an interactive IRC channel or forum. If you need interaction, please visit one of the Freenode IRC channels I am in. Sinc eI have no detail at all about your system setup I am unable to comment on your reports. All I can say: it works for me. About your question “hy can’t we just use Jack and not ALSA” – that is perfectly possible if all your applications are jack-aware. Most are not. IN particular, everything in Slackware is not, and the packages in my own repository are not, either. I got SimpleScreenRecorder working, too, and it recorded the video plus the Jack audio of my system flawlessly, much better than Record My Desktop! The only thing I need to figure out how to do now is make a mic loopback device so I can do voice-overs. So, I figured out all I had to do was connect my system captures to my ploop playbacks in Qjackctl’s Connections box. I ended up making this change globally on my laptop. My sound experience overall is greatly improved. Having a flash app using sound in a browser tab no longer stops all other system sounds from working. This is a great improvement for me anyway. I’m having trouble getting a Bluetooth headset to work with Jack (and Phonon etc.). I read that Pulseaudio is required; is that true? I do not own a bluetooth headset so I can not really comment on that, but I seriously doubt that pulseaudio is required for anything when Jack is concerned. Jack seems to default to my laptop’s built-in microphone over my USB microphone. How do I make my USB microphone default? With those mods, it’s working great. I followed all the instructions for “Reverting this bridged ALSA-Jack setup”, but JACK, loopback, etc. sound devices still show up in Phonon. I’ve even reverted to a default .asoundrc, yet the devices still don’t go away. KDE’s Phonon remembers the sound devices it once found. Usually KDE will be triggered by the removal of a sound device with “do you want KDE to remove these sound devices” with an option not to ask again in future. You may at one point have indicated not to be asked again. and delete the non-existent sound devices there. and everything went smooth as Slackware64-14.1. Great Job made mine easier. If you upgrade the kernel and have added the “modprobe snd-aloop” command to the file “/etc/rc.d/rc.modules” then be aware that “/etc/rc.d/rc.modules” is in fact a symlink to “/etc/rc.d/rc.modules-$(uname -r)”. Upgrading to a new kernel means that this symbolic link is changed to point to the new rc.modules file matching the new kernel. Therefore, the “modprobe snd-aloop” line must be added to the new rc.modules flle !! If you forget this, your sound will stop working for all applications that use the ALSA-to-JACK bridge when you boot into the new kernel. Hi Eric, long time no ear… I’m trying to set up Jack on my system but installing your packages on top of the default ones leves some thing broken: the jack_alsa.so complains about the wrong LIBC configuration, also, jack_firewire and jack_oss can’t be loaded. This makes qjackctl not starting. I removed the .so files from there and recompiled jack_alsa from sources. Not sure if it works yet because haven’t tried it yet…. Hi Davide, long time indeed! Hope you are doing well. Did you install the jack package for the Slackware version you are running? Do you still have the exact LIBC error message so that you can post it? Normally, this should not happen unless you have a hybrid system, a mix of the very old and newer stuff. Thanks a lot for sharing. But I always get failure in Ubuntu trusty (14.04) when starting qjackctl with the message “D-BUS: JACK server could not be started. Sorry”. But still failed. Does anyone meet the same issue like me? Hello Eric, thank you so much for this! Hi Eric, it’s me again. I recently installed jack on my notebook and it’s working great except for this ‘side problem?’. Whenever I suspend my laptop it kills the jackd deamon and I have to reboot to get sound back again. Do you know if there’s something I can do to avoid/prevent this issue? Thank you so much for this, I have been messing around with jack on linux for about a week now and to be honest good information is scattered to the winds. It’s like such an old topic that the people with the knowledge are kinda hard to reach and it’s a lot of nonsense around. Anyways manually scripting these files make things a lot easier for me. I can switch from casual browse the web and have my hdmi connected with relatively high latency to switching to making a beat with seq24 and zynaddsubfx with just a few scripts. I was trying to come up with a all in one solution with the kxstuio tools but that just doesn’t work well. It’s high performance or relax mode. Anyways you filled in a lot of the little banks in my mind and now I have it working just how I want it to work. Thank you!